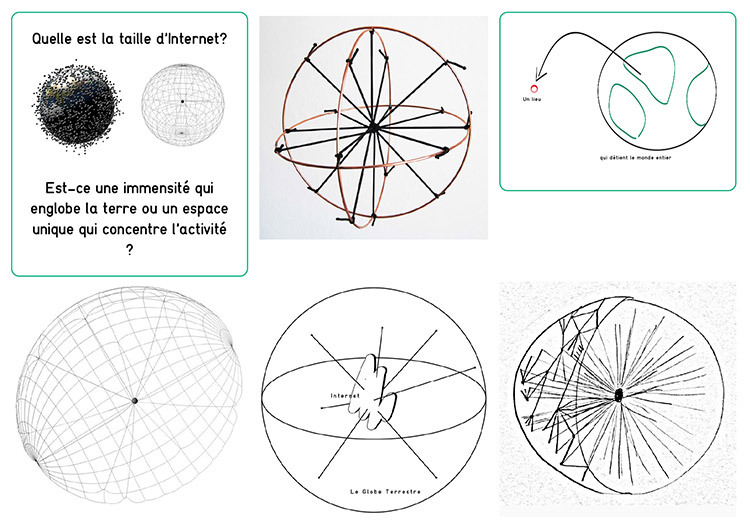 Louise Drulhe’s “Critical Atlas of the Internet” is a website, a book of in(de)finite formats and an exhibition at La Paillasse. This “fluid design” prototype questions control architecture in the network age. “We build our tools, then it is they who build us,” wrote Marshall McLuhan. We built the Internet as a decentralized tool, yet here we are dominated by GAFA… Such was the observation of Louise Drulhe, 25, after being immersed for two years in a space that is not a space—the Internet—, perceived from the angle of control architecture and the graphical representation of data. Freshly graduated from the School of Decorative Arts in Paris, she has just begun her three-month residency with mini-show at Parisian biohacklab La Paillasse, in order to continue researching “a topography of Internet space”. 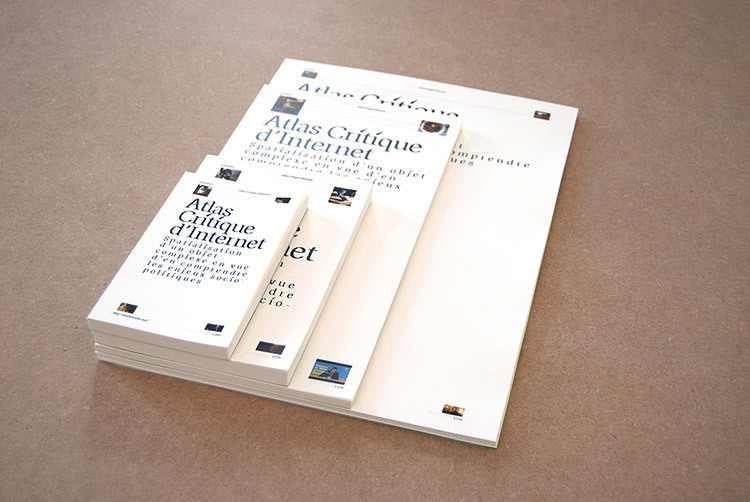 Through her Critical Atlas of the Internet, Louise developed a publishing platform with infinite possibilities, based on the principle that on the Internet, size format is unmanageable (the same web page can be displayed on a smartphone or a 24-inch screen). Similarly, her Critical Atlas of the Internet is a book that can be constantly reconfigured according to the receiver’s desire. It’s a prototype of “responsive” publishing—she speaks of “responsive print”—used to refer to a website design that adapts to the reader’s medium or device. The Critical Atlas of the Internet is a strangely multifaceted object that obliquely tackles the thorny question of control architecture. The Internet is a hybrid space: on one side, a network of networks made up of a maelström of wires and servers; on the other, a “virtual” space that is very real in economics and politics, for example. 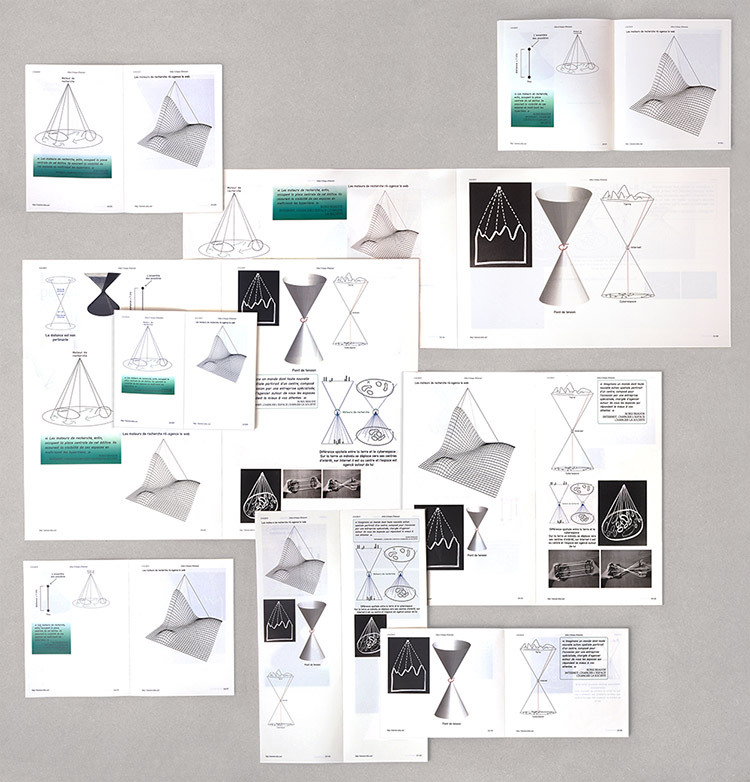 Louise first deepened her research on “fluid design”, or “the mutating relationship between graphic design and space”. “I thought I would find lots of literature on the topic, but besides Boris Beaude in Internet: changer l’espace, changer la société, very few articles and publications consider the Internet from a spatial perspective as a tool for socio-political analysis.” So Louise began her research (which earned her a degree with honors) on 15 hypotheses for spatializing the Internet (“like a scientist,” she says), where the Internet is represented by a point, a relief surface, a cone… Basically “a series of considerations on representing and mapping the space of the Internet” to show its evolution, from a decentralized and democratic model (each one is potentially both emitter and receiver) to GAFA. If the Internet is a “predefined relief”, then the most powerful (GAFA) weigh down all the elements and curve the space. In the early days of the Internet, people created their own personal homepages; today, most use Facebook and consorts. 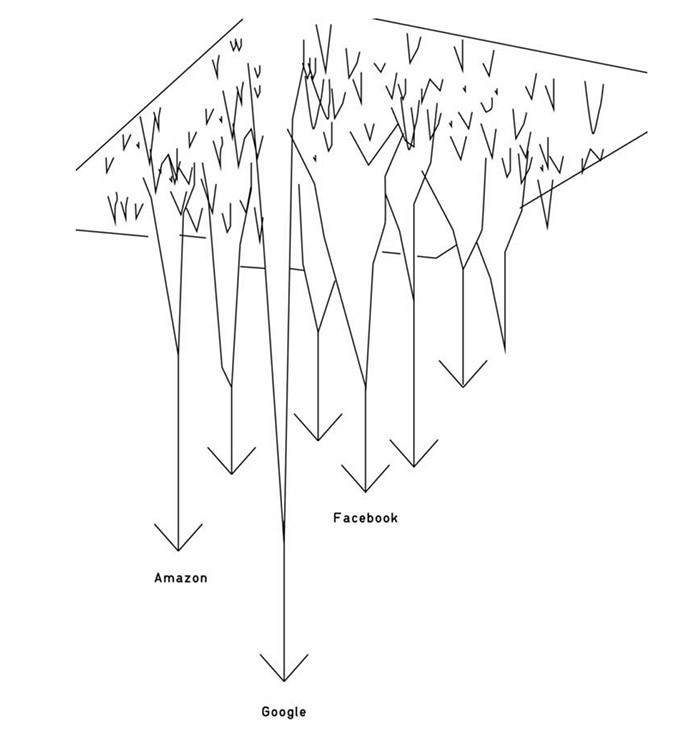 GAFA have “dug into the surface of the Web, dragging down their slope many activities that could have remained independent and decentralized,” Louise explains. Another hypothesis is that the “Internet is a dumb network”, where intelligence is pushed out to the borders of the Internet. When information transits through computers in the middle of the network, they execute only simple tasks, i.e. “dumb”. This hypothesis explains the issues of Net Neutrality, where equal transmission is guaranteed by a dumb network. 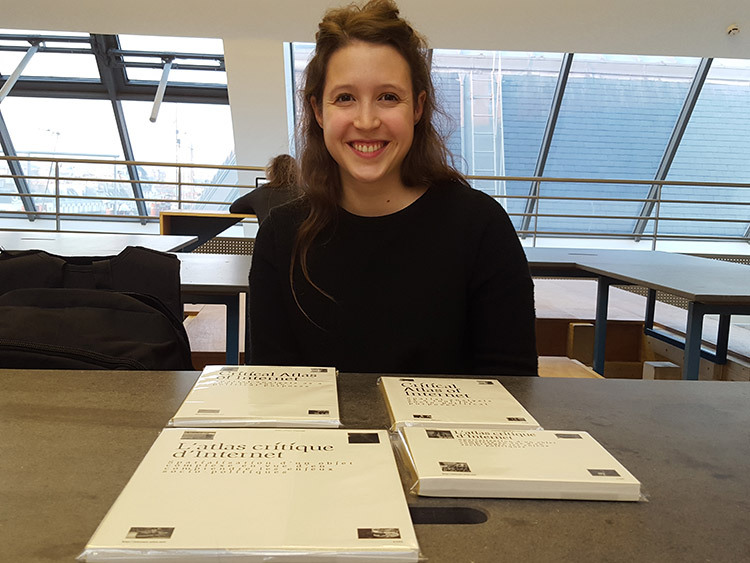 Louise is currently beginning her three-month residency at La Paillasse, where she will continue her research on the spatialization of digital issues. The exhibition (May 19-22) showed the various objects (screen, small-format book, poster, video) and her perfectly chilling design documentary about the blockchain… in which this new infrastructure, although promising, could potentially become another control architecture. The public blockchain is still decentralized and democratic for now. But what about private blockchains? This same architecture “re-established top-to-bottom control”, “a traditional pyramid system”, which has already caught the interest of investors and banks, affirms the young designer.